There’s certainly no shortage of high-end, high-performance portable vaporizers on the market today. The Crafty, Mighty, Prima and PAX 2 are all top shelf vapes that are clear choices for vapor connoisseurs with disposable income. However, if you’re ballin’ on a budget (like so many of us are), picking a portable vape isn’t quite as easy. Enter the APX. The “bargain bin” is typically muddled with cheap Chinese re-brands and knockoffs that are usually constructed from unsafe materials. Using some of these units essentially eliminates the health benefits of vaporizing altogether. Those who have purchased a portable in the $50-$100 range are often left with a bad taste in their mouth – literally and figuratively. There just aren’t a lot of great options at this price point – which is why I was really excited when I got my hands on the new APX from Pulsar. 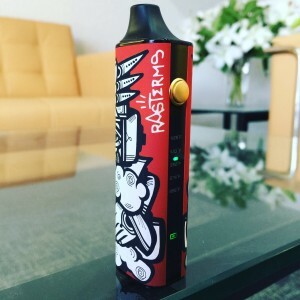 This is the first exclusive vaporizer (not a re-brand) that Pulsar has ever released. Let’s see how it performs. T he APX that I received is a limited edition version which features artwork from Oakland, CA street artist Ras Terms – and it looks rad! The design is really nicely done, and I’m really liking the red, black and white color scheme. Even the box looks great. This special edition is a little more expensive than the standard color and design options, but not by much ($70 compared to $60). The unit itself is super-lightweight and compact. Not quite as tiny as something like the Magic Flight Launch Box, but still definitely concealable in the palm of your hand (with maybe the mouthpiece sticking out just a tad). Considering the price, the APX feels pretty well put together, especially compared to other units in this price range. Upon inspection, I noticed a rattling sound, which I quickly realized was coming from the screen assembly, which I easily remedied but just tightening it up a bit. My one and only concern about the build is the mouthpiece. It fits on nicely and seems secure enough, but I feel like down the line after some wear and tear that it could become looser over time. However, Pulsar sells a replacement for only $13, so if an issue does occur at some point, it’s good to know that it’s a quick, cheap fix. The APX is equipped with a nice little LED display that indicates temperature setting as well as battery life. However, unlike a lot of portables in the price range, you don’t have to rely solely on the LED lights to tell you what heat setting you’re at, as the APX also has the temperature levels etched onto the display. That’s something I always hated about units like the G Pro – where a red light means one thing, and a green and a blue light mean another. It always confused the hell out of me, so I’m glad Pulsar eliminated that guessing game. 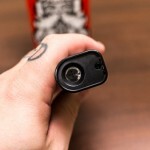 Popping off the mouthpiece reveals the APX’s ceramic chamber. The chamber is accommodating, to say the least, and can fit a generous 0.35g of loosely packed herb. I much prefer a ceramic chamber like this as opposed to a stainless steel chamber like so many units in the price range have. 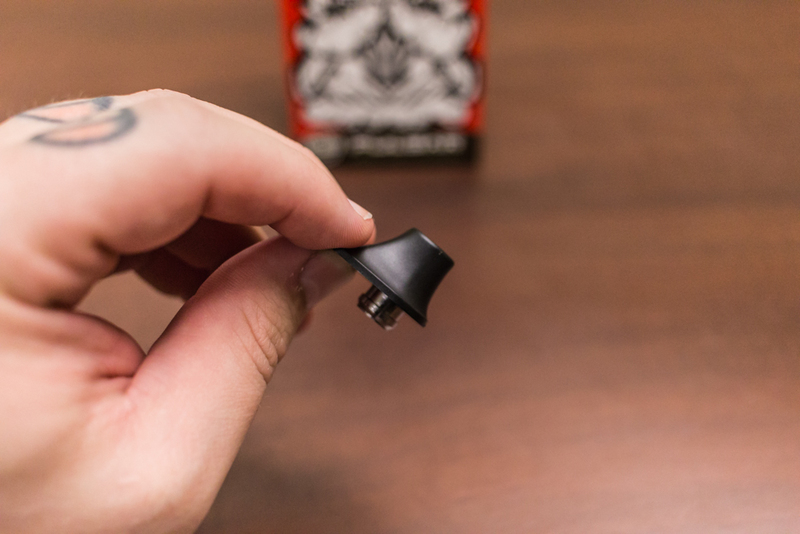 When replacing the mouthpiece, you’ll notice there are two little notches on each end. I’ve found (as the instructions outline) the best way to put it back on and ensure it stays secure is to insert the end opposite the actual mouthpiece hole first and then click on the opposite end. 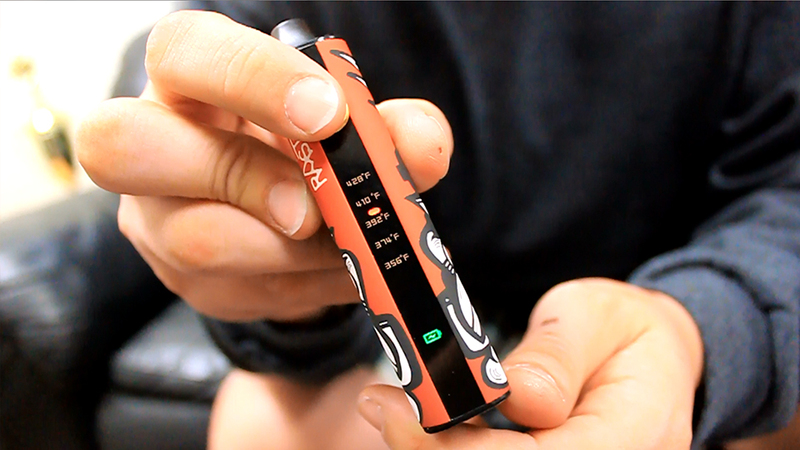 Once your herb is packed, activate the APX by clicking the power button five times. Once on, you can toggle through the preset heat settings by holding the power button for three seconds. As far as temperature options go, the APX gives you five to choose from: 356°, 374°, 392°, 410°, and 428°F. This range covers all the basis, and I really like the presets that Pulsar decided to go with, although it seems like the gap between 374° and 392° is kind of wide – so if you typically prefer a temp in the 380°’s you’re out of luck – so that would be my only critique in that area. After setting the APX to my preferred setting of 392°, a red light indicates the unit is heating up. In just about 40 seconds, the red light changes to green, and you’re ready to vape. 40 seconds is right on par with other similarly sized portables, and is PDQ (pretty damn quick) when compared to larger, higher-end portables like the Haze, Crafty, Ascent and Prima which all take over a minute to reach temp. 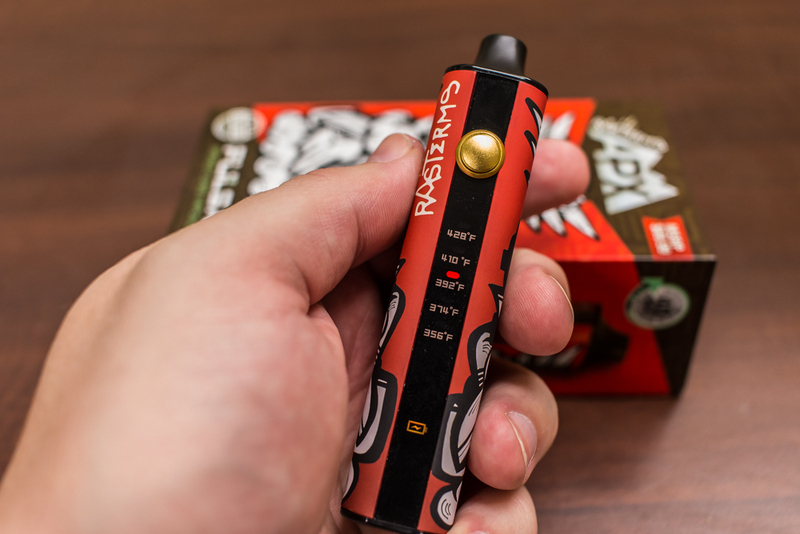 Once your desired temperature has been reached, the red indicator light turns green, and you’re ready to vape. Upon taking my first draw at 392°F, I have to say, the taste is way better than I had expected. I’ve had at least one session with every portable vaporizer under the sun and have been pretty underwhelmed for the most part by the vapor production and taste of any unit that retail for under $150 (with the exception of the MFLB, which is one of my all-time favorites). With that being said, I wouldn’t say the flavor o the vapor the APX puts out is on the level of the miVape, but it certainly surpasses any other unit in its class. As far as vapor production goes, the APX puts out! 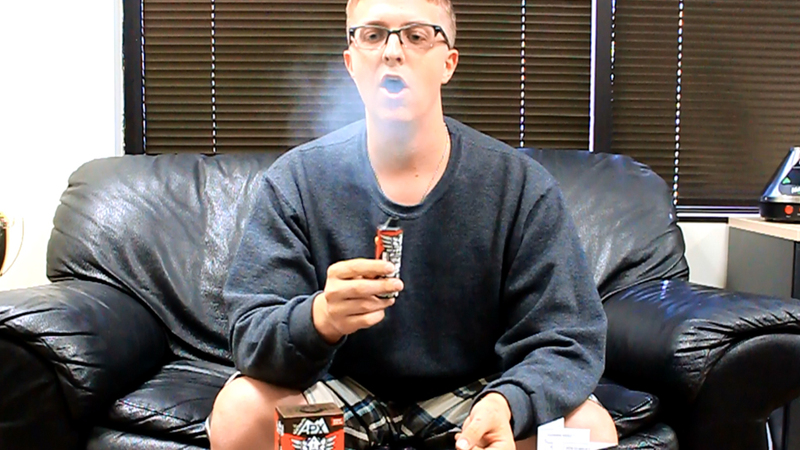 As you can see in our video review, we were getting large, tasty clouds rip after rip. This is an area where the APX really shines when compared to other entry-level units. As someone who began my obsession with vaporizers working as a customer service representative for a vaporizer manufacturer, I can tell you that one of the biggest complaints not just from newbies is that they can’t physically see the vapor. Even if they can taste it, and feel the medicinal effects, the fact that they didn’t exhale a massive cloud that they’re used to leads them to believe the vape isn’t working. As someone who began my obsession with vaporizers working as a customer service representative for a vaporizer manufacturer, I can tell you that one of the biggest complaints not just from newbies is that they can’t physically see the vapor. Even if they can taste it, and feel the medicinal effects, the fact that they didn’t exhale a massive cloud that they’re used to leads them to believe the vape isn’t working. My life would have been so much less stressful if the APX was around when I was working customer service! When using the APX, there are no uncertainties. Vapor is produced immediately, and there’s no shortage of it. After about 6 or 7 draws, you’ll start to get that burnt popcorn taste, and you know you’re at the end of your session. Inspecting the ABV revealed a nice, even golden-brown coloration, with no charring or black. This is ideal and certifies the APX as a true vaporizer which operates on the basis of convection, not conduction. At the time we shot our video, we, unfortunately, didn’t have any wax on deck (bummer) but have since been able to take the APX for a spin with concentrates. Included in the box is a little steel concentrate cup. Using the tweezers which are also included, unscrew the top lid and load your favorite wax or waxy oil directly into the cup. As you might expect, there is some sort of absorbent wicking material at the bottom of the cup beneath the screen. From here, use the tweezers to replace the top cap and insert the entire cup into the chamber. I’d recommend setting the APX to the highest temperature setting of 428°F for concentrate sessions, as wax typically requires a higher heat to produce vapor than dry herbs. Like with most other portables that support wax concentrates like the Ascent the Haze, it takes a couple of draws on the APX before you start to see some visible vapor, but once it gets going, there’s no shortage. The thing I like about the APX’s wax setup is the fact that you load your concentrate into a separate cup, which you then insert into the chamber. This eliminates gunky buildup in the chamber, and in-turn makes cleanup and maintenance very painless.The only thing that bothers me about the wax cup is it’s kind of a pain to remove and replace the screen. It would have been nice if instead of stating the obvious in the otherwise very informative and well laid out instruction manual, they gave some tips or insight of how to actually remove the screen. Aside from that, I’m a fan of the APX’s wax capabilities. 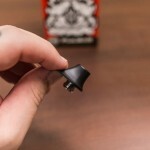 The only thing that bothers me about the wax cup is it’s kind of a pain to remove and replace the screen. It would have been nice if instead of stating the obvious in the otherwise very informative and well laid out instruction manual, they gave some tips or insight of how to actually remove the screen. Aside from that, I’m a fan of the APX’s wax capabilities and functionality. Equipped with an embedded 1600mAh lithium-ion battery, the APX will last for about 10-12 sessions, or somewhere around 1.5 to 2 hours of continuous use depending on your temperature selection. Pulsar recommends an initial charge of 3 hours before first use to condition the battery, but after that, the unit will fully charge in about 1.5 hours. While charging, the battery indication light will flash red until fully charged, at which point the battery indicator will change to solid green. The APX does not support battery pass-through, and Pulsar strongly suggests not using the unit while charging it to prevent shorting out the electronics. Overall, I couldn’t be more impressed with the APX. Like I said previously, this unit is not meant to compete with high-end units like the Crafty, PAX 2, Prima or the Haze. Priced just under $60, Pulsar designed the APAX to be the savior of the underwhelming and unsatisfying entry-level portable vaporizer space. I’ll say this, though, I guarantee that fanboys of the aforementioned top-shelf portables would be pleasantly surprised with how well the APX performs across the board. I highly recommend the APX to anyone thinking about getting into vaporizing looking for an affordable, easy to use introductory unit – as well as any seasoned vape veteran just looking to add to their collection. You can purchase the Limited Edition Ras Terms APX directly from Pulsar. Or if you purchase from this recommended online retailer, you’ll receive free shipping as well as some free goodies. Interesting… Thanks for the review. Yeah I don’t think it’s a re-brand. It looks like Pulsar has been selling it for awhile now. You’d think if it was a re-brand you would have seen clones floating around by now.